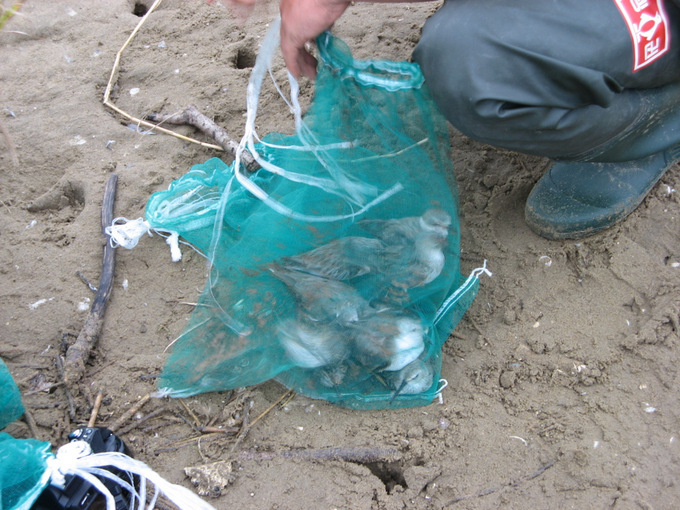 Figure 1: A “Shopping bag” of shorebirds: appropriate treatment? Yubu Island, September 4th, 2012. Image copyright of Lee Jung-Kyu. On September 4th 2012, two Birds Koreans (Ms. Lee Jung-Kyu and NM) and several staff from the East Asian-Australasian Flyway Partnership Secretariat (EAAF P) visited Yubu Island in the Geum Estuary (Republic of Korea). Yubu Island is a well-known Ramsar site, supporting probably the nation’s largest remaining shorebird roost (approximately 16,000 shorebirds counted there by NM on August 31st). We arrived at 5AM, timing our visit to coincide with high tide, with the aim of observing Critically Endangered Spoon-billed Sandpipers Eurynorhynchus pygmeus either at roost or on the falling tide (at least six have been found by Birds Korea research at this site since late August). Our joint visit was not motivated simply by the desire to see one of the World’s most charismatic and threatened bird species. Birds Korea has been the Republic of Korea’s Spoon-billed Sandpiper Task Force team member since 2004, and the same Task Force was formally endorsed by the EAAF P in 2010. Both organisations highlighted the need for this species’ conservation at a press conference in Seoul on September 3rd (http://www.birdskoreablog.org/?p=5809). And the EAAF P Secretariat is also working with local government to help improve conservation opportunities for shorebirds at Yubu and in the Geum Estuary – an EAAF P shorebird site. While waiting for sunrise, we were passed by two men pulling a small wheelbarrow. They flushed many hundreds of birds in the near-dark – but soon after many returned, as the beach was the only area of land remaining above the tide. At 0630, it was light enough to find a roosting Spoon-billed Sandpiper. Within 20m, we also saw a Sanderling Calidris alba with a broken leg and behind it a near-moribund globally Vulnerable Great Knot Calidris tenuirostris. Increasingly concerned, at about 0700 we moved down the beach, and less than 200m away found two long mist nets and three people extracting shorebirds from the nets. Birds were being placed into approximately ten nylon mesh bags. On closer inspection, some of the bags contained ten to twenty shorebirds, piled up one on top of the other, with many birds showing obvious signs of distress. Several shorebirds were also still tangled-up in the nets. We approached the trappers. They would not tell us their names, but instead explained that they worked for a department of the Ministry of Agriculture, and were there to take blood samples from “common species” of shorebird in order to test them for avian influenza (AI). One stated that he would be willing to release any rare or protected species, but was unable to identify correctly a shorebird in one of the bags that he was shown. Against the protests of the trappers, we therefore took the unilateral decision to release the birds as they were being held in such obviously poor conditions. Species contained in the bags that I helped to empty included a globally Vulnerable Far Eastern Curlew Numenius madagascariensis, a globally Vulnerable Great Knot, single Greater Sand Plover Charadrius leschenaultii, Broad-billed Sandpiper Limicola falcinellus and Eurasian Whimbrel Numenius phaeopus, and several dozen other shorebirds made up largely of Dunlin Calidris alpina, Kentish Plover Charadrius alexandrinus, Mongolian Plover Charadrius mongolus, Sanderling, Red-necked Stint Calidris ruficollis and Terek Sandpiper Xenus cinereus. Figure 2: Opening the bags. Yubu Island, September 4th, 2012. Image copyright of Lee Jung-Kyu. 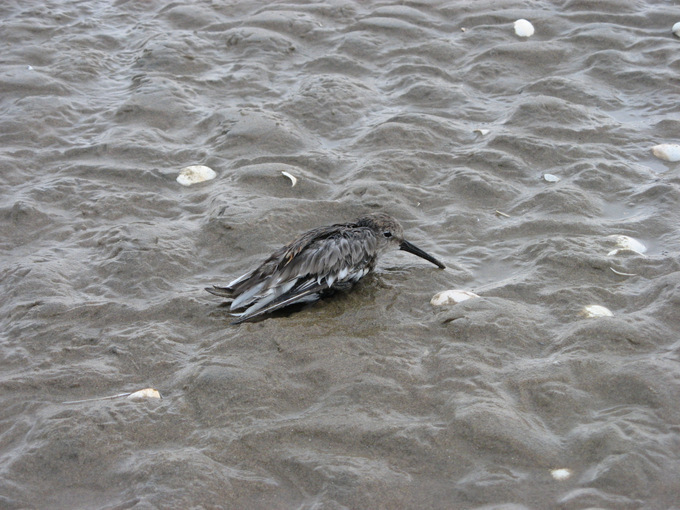 In one bag we found a dead Terek Sandpiper and a Dunlin that was wet and bleeding on its back and under both wings. Although the majority of birds were able to fly shortly after release, some had difficulty moving. 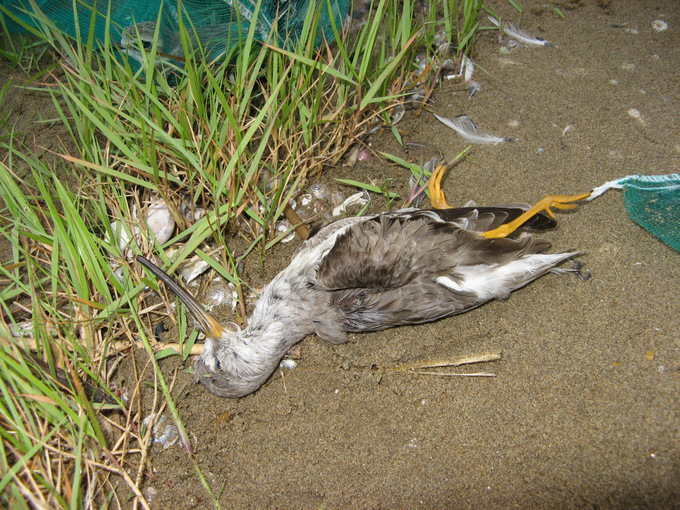 Figure 3: A Terek Sandpiper found dead in one of the “shopping bags”. Yubu Island, September 4th, 2012. Image copyright of Lee Jung-Kyu. Figure 4: One Dunlin had lost much of its feathering, and after release remained on the tidal-flat, shivering. Yubu Island, September 4th, 2012. Image copyright of Lee Jung-Kyu. Together with Chief Millington of the EAAFP Secretariat, several of us then attempted to remove some of the shorebirds that had been left tangled up in the nets. While one Kentish Plover was removed safely, a Mongolian Plover was less fortunate: it was bleeding, and appeared likely to die soon after. 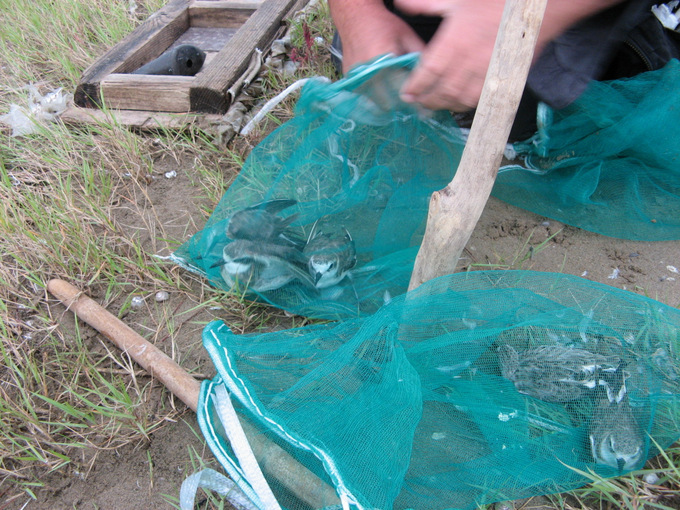 Figure 5: Attempting to release a Mongolian Plover, tangled up in one of the mist-nets. Yubu Island, September 4th, 2012. Image copyright of Lee Jung-Kyu. Both personally and as someone working for a bird conservation organisation, it is easy to appreciate the need for research on diseases in birds, including AI. In 2006, I was part of a Food and Agriculture Organisation (FAO) mission to investigate an AI outbreak in the ROK (CMC 2006). Following extensive coverage of AI issues on the Birds Korea websites (see: http://www.birdskorea.org/Our_Work/H5N1/BK-H5-Poultry-Flu.shtml), I was also invited to present on public perceptions of the disease to an expert meeting of the Ramsar Convention Science and Technical Review Panel in 2007. As an organisation, we recognise (of course) that AI can cause death in some bird species, and that it has also caused massive economic damage to the poultry industry and some mortality in people that have come into close contact with infected birds. However, while shorebirds often carry Low Pathogenic AI, it is also important to note here that “shorebirds do not appear to transmit or spread H5N1” (FAO 2007) – the AI virus which has been the main focus of much recent research. 1. AI viruses in shorebirds can be identified using a much less intrusive methodology than trapping. Two-thirds of 21,000 samples tested for AI in Australian waterbirds (including shorebirds) were collected from faeces (Hansbro et al. 2010). Such a research approach can generate a large number of samples without causing undue disturbance or injury. 2. 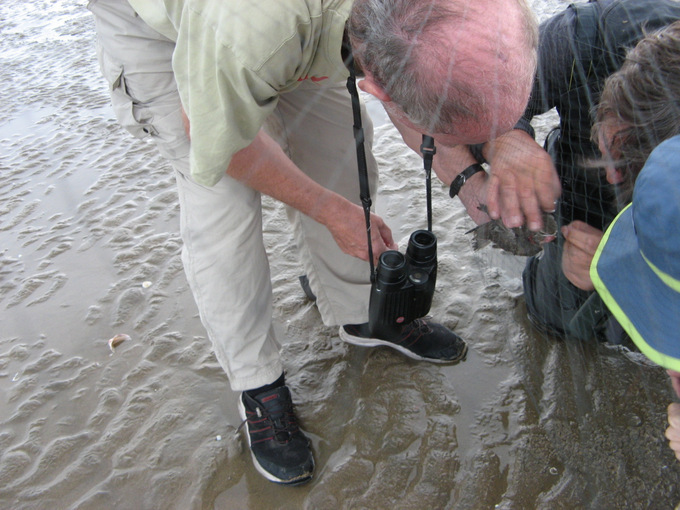 If birds are to be caught in nets then only highly-experienced researchers should take part. The EAAF P has already supported training programs for AI researchers in Mongolia (see: “Building capacity for shorebird research and conservation in Mongolia – the 2012 workshop and expedition” (at: http://www.eaaflyway.net/partnership-news.php). 3. Moreover, the FAO provides clear guidance on how to catch and process birds. This guidance emphasizes that “The health and well-being of the birds should be the primary concern during all phases of capture” (FAO 2007). a) That “It is essential that the number of nets be limited to that which the field crew can effectively deal with should a large number of birds be caught”. The trappers admitted to us that there were too many birds for them to handle. b) There should “Always (be) a sufficient number of experienced personnel (at least four) available before undertaking any capture operation” and “An open mist net should never be left unattended for more than a few minutes, under normal conditions 15-20 minutes maximum.” Only three trappers were present. At least two of these arrived after more than an hour after high tide (when most of the birds would have been trapped), and some birds were still hanging in nets more than two hours after high tide when they were likely first caught. c) The need to “Monitor weather forecasts prior to conducting capture efforts to ensure birds are not captured during extreme climatic conditions when they may be at increased risk of hypothermia or hyperthermia” and the warning to “Never use mist nets in the rain. Birds netted in rainy conditions are vulnerable to hypothermia”. Heavy rain had been forecast for later that morning (on both television and on the Korean Meteorological Association website), and had started to fall even when birds remained in the open in bags and in nets. There was no dry shelter for birds to be held in. d) “AI disease surveillance involves the handling of bird species known or suspected of being H5N1 virus carriers; thus appropriate precautions should be taken to avoid the mechanical transmission of pathogens between birds and sampling sites (consult FAO 2006).” Moreover, “The use of personal protective equipment (PPE) appropriate for the level of risk is strongly advised even when clinical signs of disease are not evident in birds in the region (consult FAO 2006).” None of the three trappers wore gloves, and several shorebird species were held in “mixed bags”. There appeared to be multiple ways in which pathogens could have been transmitted between birds, and also between birds and people (and through their equipment, potentially to other sites). e) “Preferably an appropriately trained veterinary clinician will be available to examine and treat any injured or distressed bird, but, at the very minimum, a basic first aid kit should be included in the equipment list of every field study involving the handling of wild birds” (FAO 2007, p.66). No bird was treated for injuries and there was no evidence that the trappers had any first aid kit or any knowledge of how to treat injured birds. f) In addition to physical injury, “The signs of shock and inertia are generally similar; birds become unresponsive to external stimuli to the point that they appear “frozen”. We observed several birds that were unresponsive and “frozen”. g) “Hypothermia can occur in cold conditions when feathers become wet and lose their insulating properties…Birds suffering from hypothermia should be dried and placed near a heat source”. The trappers had no heat source with them – and at least one Dunlin showed obvious signs of hypothermia. If we had not intervened all trapped birds would have been exposed to heavy rain. In light of the above, it is clearly unreasonable and untrue to suggest that no harm was caused to the birds (see: http://www.hani.co.kr/arti/society/environment/550176.html), or even that the trapping was undertaken by skilled researchers. The trappers did not follow published FAO guidelines and showed very little concern for the welfare of the birds they were handling. It is clear too therefore that a set of guidelines should be produced (e.g. by the Ministry of Environment and the Ministry of Agriculture) to be followed by researchers from all ministries and universities, so that best data can be gathered and animal welfare maintained. c) In areas known to support globally-threatened species (unless individual globally-threatened species are the focus of a special targeted research program). Please share the above information widely (while citing source and maintaining copyright of the images). We welcome your comments. CMC 2006. CMC MISSION REPORT. Understanding the potential role of wild birds in the epidemiology of the current HPAI outbreaks in the Republic of Korea 13-21 December 2006. FAO special mission to the Republic of Korea. Hansbro, P., Warner, S., Tracey, J., Arzey, K., Selleck, P., O’Reilly, K., Beckett, E., Bunn, C., Kirkland, P., Vijaykrishna, D., Olsen, B. & A. Hurt. 2010. Surveillance and Analysis of Avian Influenza Viruses, Australia. Emerging Infectious Diseases. www.cdc.gov/eif. Vol 16, No. 12, Dec. 2010.